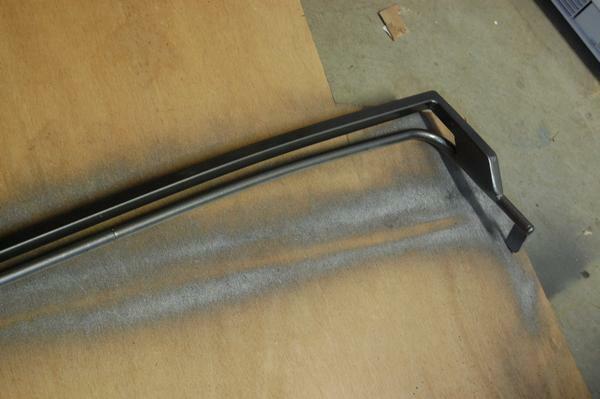 After viewing various commercially available wind deflector options for my MGB, I decided to make one up of my own. The following is a description of how I made it. 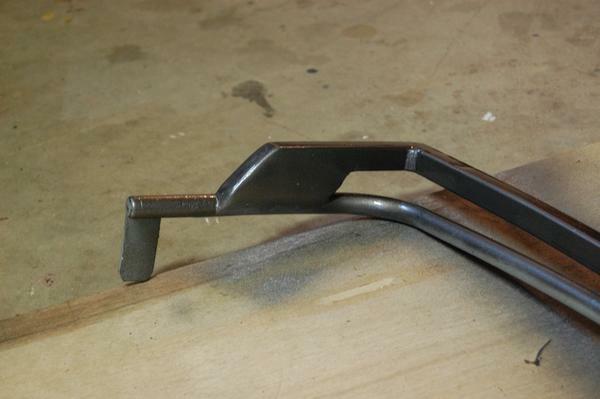 You will need some basic welding and fabrication skills to make one for yourself. 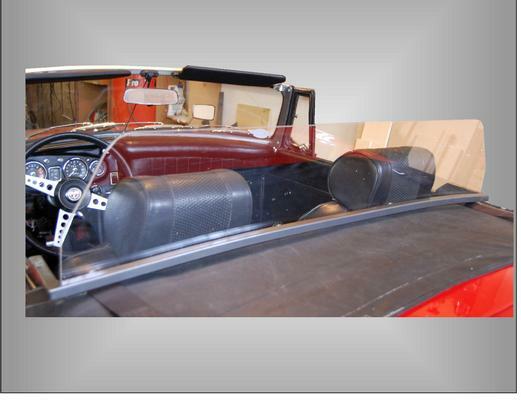 First, I removed the converible top cover support rail (aka tonneau bar). Using 3/4" square tubing, I bent a length to fit to cross contour of the support rail and cut this piece to the length of the support rails. By cutting and welding 2 forward pieces onto the new cross rail to match the width of the support rail, I then had a matching "U" shape to the support rail. Using the same 3/4" tubing, I welded spacer blocks to the forward pieces and in turn welded these onto the support rail. I now had a double support rail with a space between the 2 for the tonneau cover to fit between the 2 rails. After raising the top and installing the rail, I made up a template for a piece of 1/4" thick plexiglass to fit onto the upper rail but also fit within the top when the top is in the up position. The plexiglass was then cut from the template and attached to the top rail. The deflector now just fits into the slots for the cover support. To raise the top, remove the deflector, raise the top, and before lowering the rear section of the top, reinstall the deflector. At this time the rear of the top can be lowered down over the deflector. 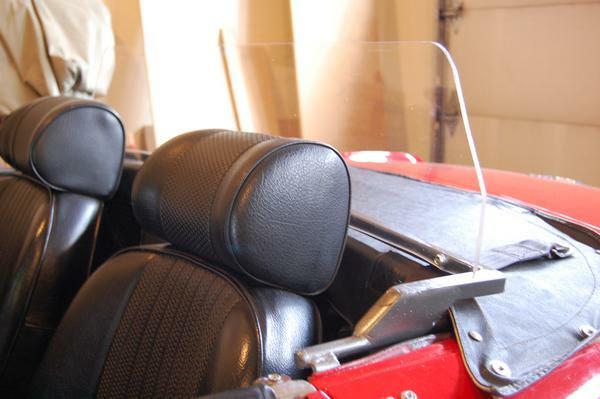 Comments on "DIY MGB Wind Deflector"
What thickness, size, dimensions of the plexiglass? How is it attached to the new rail? Needs more details, please. I used 1/4" thick plexiglass, the rough dimensions are 8 1/2" high x 45" wide but as mentioned I would fit the rail, raise the top & make a template for plexiglass to fit inside of the roof when it is raised. The plexiglass is attached to the frame with 4 sheet metal screws & I welded the deflector frame to the tonneau cover rail. The main thing to watch for is that the width of the frame is adequate to clear the top bows when raising & lower the top, I have a folding frame style of top with only the 1 arm & mine clears fine but the other style may be close. I made one of these for friend that has a hearing aid & he used to take his hearing aid out when driving his car & now he leaves it in. Nice work on the wind deflector Tim, I like the graphics lighting up. Nice work on the car also. Great job designing and fabricating it. I'd like to build one, too. I have a stick welder and think I can tackle it based on your photos but wondered how you fabricated the forward sections of the deflector bar where they're welded to the tonneau bar? Believe you used the same 3/4" square tube but did you add-in scrap steel as well or did you split open the tube stock and flatten it? Can't tell from the photo. Any other details are appreciated. Also, if you're willing to fab just the forward sections I'd be interested in buying them from you. Think I could handle the rest. Not sure where you're located - I'm in MA. Nice article - helps if you know how to weld. A minor point but we all have our pet peeves: Plexiglas is a registered trademark of Rohm & Haas (now owned by Dow Chemical). The more accurate generic term would be "acrylic sheeting." The equivalent from GE Plastics is Lexan (now owned by SABIC). It's like calling any drink in a can a "Coke." Thanks for the tip - very clever.